We’ve featured pasta and zucchini before, but this celebrated dish from the Sorrento peninsula is a bit more elaborate and intriguing. Spaghetti alla Nerano, named after the beach town where it originated, could be the child that your basic pasta and zucchini would have if it got married with a cacio e pepe. It’s a delightful combination, with zesty provolone cheese adding considerable interest to the often bland vegetable. Fry the zucchini slices in oil (preferably olive oil) until they are lightly browned. Proceed in batches if your skillet isn’t large enough to hold all the slices in a single layer. As they are done, lay the fried zucchini slices on paper towels to absorb the excess oil. Sprinkle lightly with salt. Bring a large pot of water to the boil, salt well, and throw in the spaghetti. Cook until very al dente. While the spaghetti is cooking, in a large skillet or sauté pan, sauté the garlic lightly in olive oil. Remove the garlic. When the pasta is done, drain it, but not too well. Add the zucchini rounds and then then pasta to the skillet and a ladleful of pasta water. (If you want, reserve some of the zucchini for garnish.) Mix everything together vigorously for a minute or two. (The zucchini rounds are bound to break up, but that’s normal.) Then add the grated cheese and some more basil leaves, and continue mixing until the cheese has completed melted into a creamy sauce, adding more pasta water if need be to keep things flowing smoothly. Serve your spaghetti right away, topped with the remaining zucchini slices for garnish, along with perhaps a basil leaf or two. Given the similarities, the tips for making a good cacio e pepe apply here as well. The essential point: keep mixing the pasta until the cheese melts into a creamy sauce. Even if it seems to clump up at first, don’t be discouraged, keep at it. Add pasta water as needed. Spaghetti alla Nerano is actually less tricky to get right than the Roman classic. Since you’re mixing the pasta and cheese over heat, the magic should happen pretty quickly and consistently. And any excess water will evaporate. The heat should be gentle however, to avoid scorching the cheese. The other important thing to bear in mind: frying the zucchini properly. As for any frying, you need to keep the heat fairly high and space the zucchini rounds to avoid greasiness. On the other hand, avoid browning the zucchini it too much, or the zucchini can turn bitter. Of course the choice of ingredients is key. For the zucchini, try to find if you can the more lightly colored, striated variety known as zucchine romanesche. They are a rarity here in the US, but I did manage to find some earlier this summer at a local farmers market. Failing that, look for younger (hence smaller) zucchini with lighter skins. I find they have much better flavor and texture than the larger, darker zucchini. 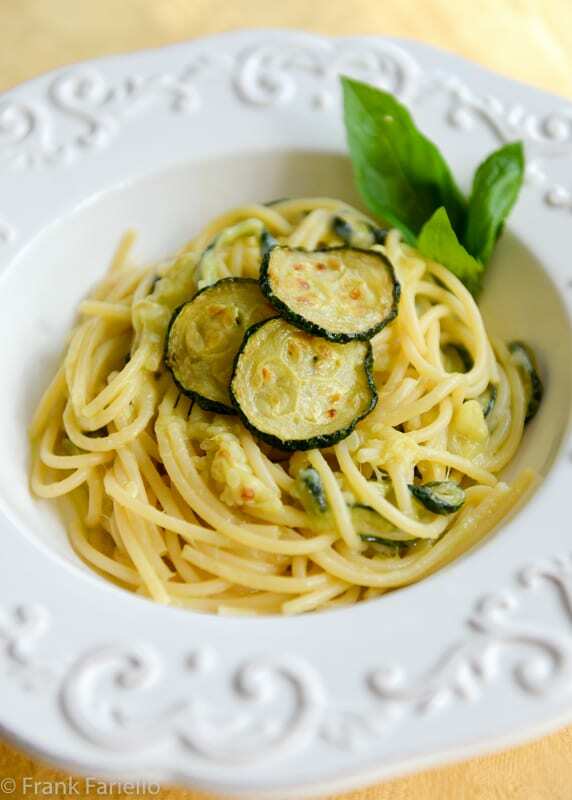 Besides the zucchini, the star of spaghetti alla Nerano is the cheese. The classic choice in contemporary recipes is provolone di monaco, a DOP cheese from the Sorrento peninsula. Provolone, like mozzarella, is a pasta filata, or stretched curd, cheese. Once the curd is separated from the whey, it is mixed and kneaded in hot water until it reaches a soft, elastic, stringy texture. Unlike mozzarella, provolone is then hung up to age. The longer the cheese is aged, the harder its texture and the sharper its flavor. Provolone dolce is relatively young, aged 2-3 months, and still quite mild in flavor, while provolone piccante is aged over four months and quite sharp in taste. 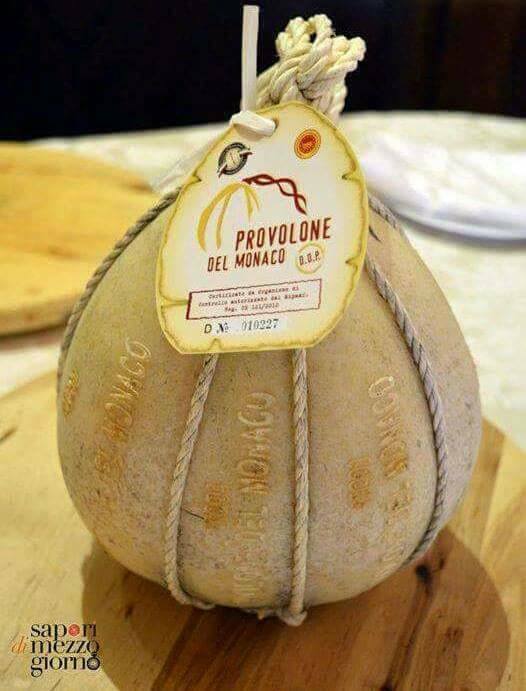 Provolone del monaco, or “Monk’s Provolone” is one of only two types of provolone to enjoy DOP status, along with provolone valpadano, produced in the Po Valley in norther Italy. The milk comes from local Agerolese cows, which is said to give it its unique flavor. It is aged at least 180 days. Unfortunately, as far as I know, provolone del monaco is not available in the US, so an ordinary provolone will have to do for us Stateside cooks. Do avoid, if you can, the pre-sliced sandwich cheese sold in many stores here—dishonestly—as “provolone”; it is more or less tasteless. If you can’t find proper provolone, caciocavallo is a similar cheese (and indeed it figures in some recipes for spaghetti alla Nerano), but can be equally hard to find. A more easily found substitute would be pecorino romano—in which case the dish really would be rather like a cacio e pepe with zucchini—or perhaps a mixture of pecorino and parmigiano. Unlike so many other famous recipes, spaghetti alla Nerano has a very precise origin. 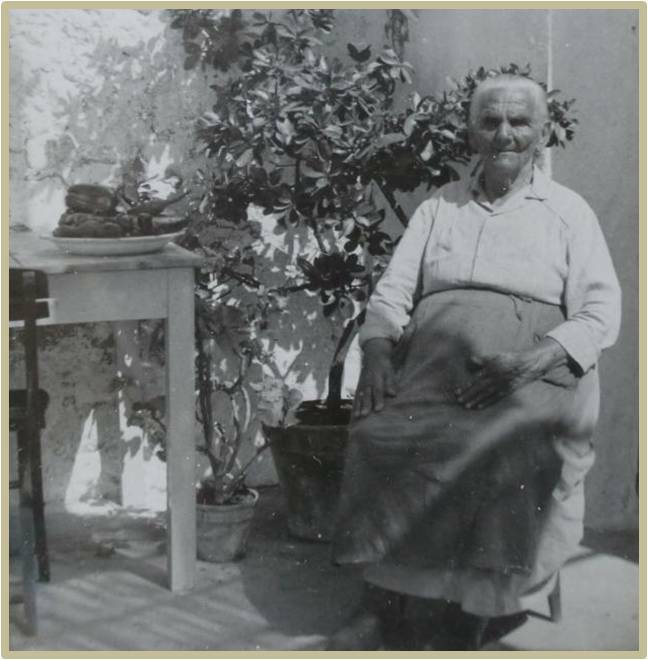 It was invented by a local restauranteur named Maria Grazia (pictured) and served at her eponymous beachside restaurant, where you can still enjoy her pasta dish today. According to the restaurant’s website, she invented the dish “just for fun” in 1952. Her precise original recipe remains a house secret. Indeed, there is talk about a “secret ingredient” that makes her version unique. But that hasn’t stopped the dish from becoming a favorite of restauranteurs and home cooks alike. Spaghetti is the classic pasta, but imagine other long pastas like linguine will work well. Have seen recipes for this dish made with short pasta shapes, but the consensus seems to be that this is heresy. In one interesting variation on this dish, Luciano Pignotaro recommends blanching the fried zucchini rounds briefly, then puréeing a portion of them. The purée is then simmered in the garlic-seasoned olive oil in the skillet to create a kind of base sauce, to which the rest of the zucchini and pasta is then added. It sounds nice, adding extra depth of flavor and another layer of texture. But when I actually tried it out, I found the result rather ponderous. The order in which you add ingredients for the final mantecatura of the pasta can vary, too: in some recipes, you add the cheese first, mix it with the pasta, then add the zucchini only at the very end, so they don’t break up. And then there’s butter: a few recipes for spaghetti alla Nerano, like some recipes for cacio e pepe, call for adding a knob of butter at the final mantecatura stage for added creaminess. And as for cacio e pepe, others (like Pignotaro) disapprove. But in this case, there are some strong indications that butter was part of the original dish. In her La cucina napoletana, Jeanne Caròla Francesconi offers up two alternative recipes for spaghetti alla Nerano. One, which she got from a certain Giulia de Luca di Roseto Abetino, calls for layering the fried zucchini rounds in a bowl with a mixture of parmesan and provolone dolce, minced basil, knobs of butter, and salt and pepper. When the pasta is cooked, it is mixed in a pan over low heat with the zucchini. She says to add a bit of the oil in which the zucchini has been fried, rather than the pasta water, if needed. This first recipe, Francesconi says, is an obvious imitation. But she offers a second recipe, passed on to her by artist Paul Thorel, which Thorel claimed was Maria Grazia’s original “secret” recipe. It calls for slicing the zucchini the day before or “early in the morning” and lightly frying the zucchini rounds in butter (with a bit of oil to prevent burning) before transferring them to a large bowl without draining them too much, so they stay rather oily. The spaghetti are then cooked and transferred to another bowl and tossed together with more butter (! ), parmesan cheese, basil, salt, pepper (or a piece of hot pepper) and, if you like, a few mint leaves. To finish, place a third of the fried zucchini in a large pan, wet with a few spoonfuls of boiling water, add the spaghetti mixed with another third of the zucchini, then the remaining zucchini are laid on top. Pour in the butter in which the zucchini have been fried, then mix everything together over very gentle heat for a minute before serving. Just ordered Provolone del Monaco ( and a lot of other wonderful things) from. Dolceterra.com. Can’t wait! Enjoy! I think you’ll like it. ? I love the simplicity of this dish. And I still have a bunch of zucchini in the garden! Perfect timing! A new dish for me – and I am always thrilled when that happens ! But SO simple . . . and I love zucchini, and here in the Antipodes, it is available all year . . . Methinks my kitchen’s fast food list just received an addition . . .
That’s great, Eha! I hope you like it. ? My Sicilian grandmother and my mother often made spaghetti with fried zucchini, a family favorite. We called it “pasta cu cuccuzza”. Yes, I know the name, Joe! Tasty dish. Really good to see this return in your weekly recipe rotation. I still haven’t made this, and really need to — such a wonderful dish. Thanks! And thank you, John, for stopping by! I’m not a huge zucchini fan, but I do cook with them and eat them and I would do just that with this dish! I just met the chef from our local Nerano ristorante here in LA, a couple of weeks ago! I’ll have to go! Well, if he’s from Nerano I bet he’ll put this dish on the menu… ! Oh, to have access to such beautiful provolone! Would love to try this, Frank. Now wouldn’t that be a dream? But still, you can make a pretty good tasting version with the Auricchio or Belgioioso provolone you’ll find at the supermarket or local cheese shop. We made this last evening – with the Belgioioso – and it was just perfect. Shallots, of course, instead of garlic. This will be in our standard weeknight rotation! Grazie tante! By the way, I caught your interview with Paolo yesterday and really enjoyed it. I had never heard of this recipe Frank, thank you for posting it along with the well documented background information. Provolone was a staple in our home growing up and I tend to use it less frequently that it deserves. I think a lot of us do the same, Paula. Regrettably. And we tend to forget it’s an excellent cooking cheese. My zucchini is done (or I thought I was done with zucchini) but may have to actually buy one (NO, NO, NO). Because this is enticing. I cannot get anything but your average-Joe zucchini but I can find mighty find provolone and I am loving the combination. And the simplicity. è proprio vero, pochi ingredienti ma scelti con cura fanno un grande piatto !Buona settimana Frank ! Grazie, Chiara. Buona settimana anche a te! What a wonderful recipe . My neighbor is giving away her extra zucchini. I wish I could find a decent cheese to make it. Ah… that can certainly be an issue, but in a pinch this dish would work with everyday pecorino or parmesan as well. This must be soooo delicious! We never had zucchini combined with pasta before and are definitely giving this a try Frank! Pinned! Thanks, guys! Definitely worth a try. Frank, It’s a new one on me. I never think to cook with provolone or caciocavallo, but this sounds fantastic. I tend to forget about them, too, but those cheeses really are fantastic cooking cheeses. They melt beautifully, and their taste is surprisingly mild when cook, yet still very flavorful. Looks beautiful.. and with zucchini harvest in full swing, I am 100% into this dish! I really enjoy the way you write about dishes. what an interesting report of the many nuances of pasta with zucchini! I had never heard of this recipe until a few months ago. In my house we make pasta with zucchini and ricotta all the time or pasta with zucchini and parmigiano but not with provolone, I will have to try, thanks for sharing Frank! You’re welcome, Letizia! Worth a try, the provolone is a nice change of pace, and surprisingly mild when it melts into a “sauce”. Hi Letizia – I thought that was you. I enjoy the recipes from this site as well. Hope you are well and please let Donna and I know if you are planning another trip to Philadelphia. We were just at Gran Cafe L’Aquila this week, brought back fond memories of when we saw you there. Oh, thank you, Frank, for this information. I’m planning on making this dish in the future but when I found it, it went by another name. But it could be that the inspiration for this dish was first tasted at Maria Grazia’s restaurant. May I use some of your information, credit you, and cite this post? Of course, Marisa Franca. I’d be delighted. Hope you like it, Paola! Neat dish. I’ve read about this, but have never had it. And I don’t think I’ve ever seen it on a restaurant menu. Like the addition of provolone — other than in baked dishes like lasagna, don’t see that featured in pasta dishes that often. Thanks! Yes, provolone and caciocavallo deserve more attention. They’re really excellent cooking cheeses. My grandmother made this for years, as did my mother and us kids, I’m 67 now, so it’s been a long time… One of my family’s favorite recipes. Fantastic, Joe. Hope I could bring back some fond memories. Thanks so much for posting this recipe. I had spaghetti with zucchini this past April in Sorrento at Ristorante The Garden da Gennaro and loved it. In fact, it is one of the most memorable dishes of the entire trip. I’ve been making my own version at home since then but I can’t wait to try this variation. Wish we would get all those wonderful Italian cheeses here in the US.